I found this problem in a quick Match, and then replied in a friendly game so, here my Report. 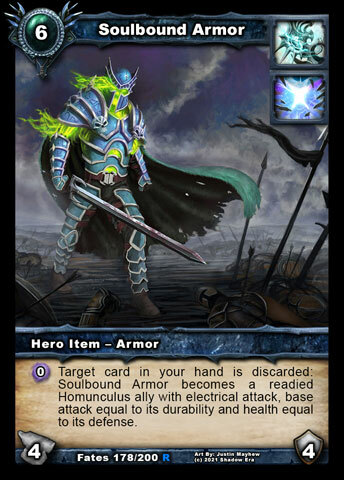 0SE: Target card in your hand is discarded: Soulbound Armor becomes a readied Homunculus ally with electrical attack, base attack equal to its durability and health equal to its defense. 1) Earthen Protector and Soulbound Armor in play. 3) Earthen Protector ability will response, so is destroyed and SA will returns like a Ally. But with strange Defense/Durability. 4) SA'owner can try attack again, but the combat is canceled before the damage stage, and Soulbound Armor is Exhaust. No Damage. You can summon other armor without problem. Conclusion: SA still in play like a Ally, can afect in cards with text of "number of allies in play" like Overwhelming, but cant be used like a ally for his/her controller. Last edited by Arcanes; 06-09-2015 at 05:51 PM. Here!! Arcania Expansion !! come and share you ideas!! suggest balanced fixes!! comment you favorite idea!! lets do a virtual edition with 200 cards of user's creations. Oh, that's a case I've never ran into before. 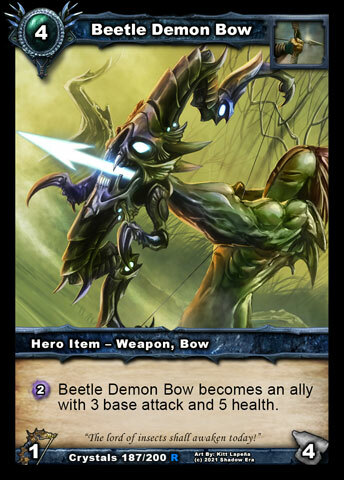 Possibly Beetle Demon Bow and allies made by Wand of Izikus have the same issues. I'll investigate! EDIT: I guess the issue is that when an ally is returned to play, it comes in fresh as its default stats ... but SA, BDB and items made into allies by Wand of Izikus all have no default ally state, since they are not even allies. They can't come back as +2/+2 of what they were when they died because they were 0HP when they died and allies are reset when they leave play anyway. Potentially, EP may have to fizzle and do nothing for them. This one might take some thinking! UPDATE: I've just tested with BDB and Wand of Izikus . None of them work correctly. I think this is an interaction no one has ever reported before and it consequently has no support in-game nor a ruling to go with it. 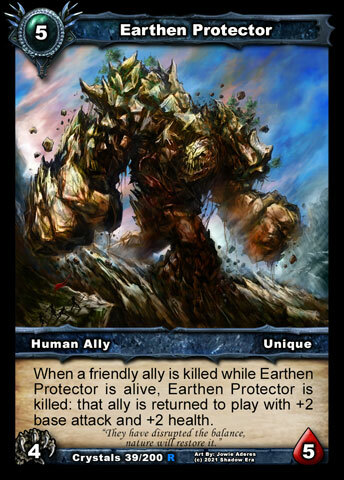 We *could* remember the stats of the card when it became an ally and return to the field with +2/+2 but that then doesn't sit well with other allies that enter play with buffs. The ally has to return with its default (and then +2/+2). 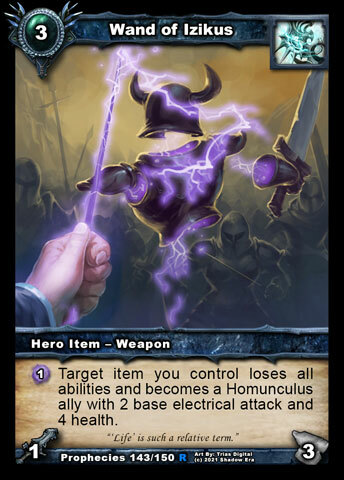 So I think we either make EP not return the card OR we have it return as a 2/2 based on a new ruling that any item that is being treated as an ally has 0/0 stats by default. Last edited by Gondorian; 06-09-2015 at 06:05 PM. A card should lose all on board status once it leaves board(go to deck/ hand/ grave). TRICKY to say the least, as it is now, I would "vote" for the return to play as a new 2/2 as it seems the most correct form of reading/triggering EP ability. I'm no expert but as I understand it "returning to play" it's different than being "summoned" so the "summon state" shouldn't be part of the equation (at least visibly, I understand it might be on game mechanics coding), just as a belladonna wont give you an extra card when returning to play. Last edited by Kosmiker; 06-10-2015 at 04:30 AM. 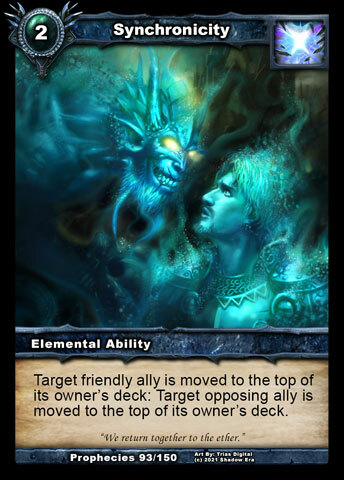 Clear ruling: For EP to return an ally to the board, that ALLY needs to be in the graveyard to be returned with +2/+2. If the ALLY is not there, either because it's an item or it went elsewhere for some other reason, EP will die and attempt to return it but fail (effectively fizzling). Since an item-based ally enters the graveyard before it is returned to play, it will lose all its previous changes, and thus, Earthen Protector will try to bring back the card but it is now an item in the graveyard so the conditions are not met, resulting in no return of the card. But I also think that Earthen Protector should not be killed unless it can bring back an ally. The ruling should be similar to that given for Synchronicity and friendly steadfast allies. If not for the comma before "and Earthen Protector is killed" then you might have a case. Regardless, in the case of ambiguity (which we do try to avoid as much as possible), the behaviour of the code defines what is correct unless it has been confirmed as a bug.